I am not absolutely sure of the year I took this photo, but it certainly was c1959. 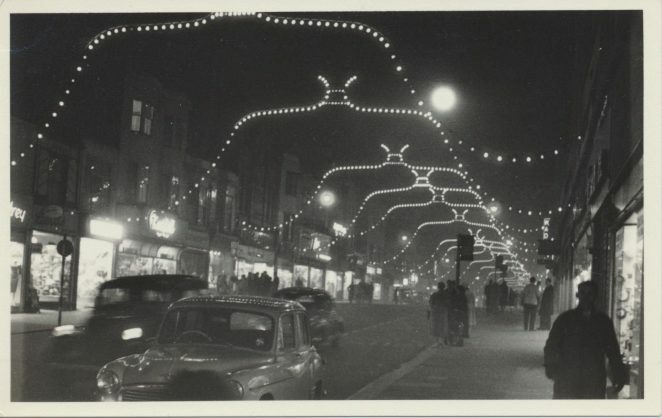 Can you remember Western Road at this time – or even remember these lights? If you you have any memories to share, please leave a comment below. What a fantastic photo. Is it at the beginning of Western Road? Obviously before Churchill Square was built. Thank you Carol. Yes, it was taken not far from the Clock Tower, way before Churchill Square was thought of. In those days I used to process my own films. The camera used was either a Voightlander Vito B or an early Pracktica. I vaguely remember the lights, but can’t place the year. Looks like you were standing outside H. Samuels the jewellers when you took the photo, opposite what is now Churchill Square. Thanks Barrie. Great to see this picture. I had almost forgotten what it looked like prior to Churchill Square. I remember buying a nice coat in the fashion shop called Audreys. It was probably the first coat I bought as I left school to go to work in another fashion shop the other end of Western Road. It was called Roma Fashions and was situated just opposite Preston Street. I well remember Lyons Cafe a bit further along where I would meet friends for coffee prior to crossing the road for a 9am start at work. Close by to Audreys was a photographic shop where my mother took me aged around six. There were about 36 photos taken of which we could choose the best batch. That was back in 1951 so maybe they were gone by the time this picture was taken. The bus stops are well familiar as mum and I would often wait there for a bus to the Old Steine and from there we could pick up the 26 to Hollingbury. Cold, draughty bus stops and very busy! Lots of hassle to get on in the hope not to hear the words – “sorry, full up”! I don’t envy those conductors. They had their work cut out in those days. So why were all those places taken down and replaced with a Square. Was that just modernising the town? We’d love to see more, do you have any others you could publish on here? I wasn’t around when this photo was taken so never knew the Churchill Square area previous to it being built. However I have seen many photographs and wonder, if it was all still there, what an amazing shopping area it would be now. Looking at this photo brought back a lot of memories. I lived in Grenville Place so I was at the back of most of these shops. To name a few, does anyone remember any of the following: Dorothy Normans, the Home and Colonial Stores, Mac Fisheries, Jan Shoes, Dewhurst the butcher, J G Emanuel, Liptons and Ted Waltons the greengrocers. The memory grows a bit foggy now but as I have not lived in Brighton now for over fifty years I think I can be forgiven for any omissions or mistakes! Hmmm! A time when Western Road was “the” shopping street on the South Coast as opposed to now when it is a hotch-potch of dis-connected shops in various stages of arrival or departure. Personally, I don’t believe that Chruchill Square did Brighton (let alone its retailers) any favours. I have the dubious honour of seeing BOTH Churchill sqs built and the first one knocked down to make way for modernisation. I never expected that to happen in my lifetime. I was about 6 in 1959 and my mum and dad and I would go to the shops every Saturday but also George st in Hove too. My childhood memories are of some of the big shops near that location having the overhead cash transfer cable system whizzing over our heads – fascinated me! And of going into Woolworth (still there!) They had a bid board with pre-built Airfix kits on it I used to gaze at longingly and I used to buy a model from there mostly every week (a B29 Superfort for 10/6 – can you imaging it?) In the background of this picture you can see the bus-stop on the opposite side of the road – everyone like frozen peas waiting to go to Portslade and Mile Oak where we lived. I can remember Dorothy Normans. My Father, Ronald Coombs was a window dresser there 1951 -1954. We lived at Montpelier Terrace, Southdown Avenue and Sussex Square during that time. I would be interested if anyone remembers Ronald Coombs and what became of him. I lived in Dean Street for about 6 years after I was born in 1953 and then moved to Upper Lewes Road but used to visit my grandmother in Dean Street. At the bottom of Dean Street and on the opposite side of the road was Sainsburys, where you had to queue up for meats and cheese at separate counters and they would cut them off for you on the marble slabs. On the same side of Dean Street at the bottom was Boots the Chemists, I can still remember the smell of the methylated spirit they used to clean their glass display cabinets. BHS was a bit further along, where Primark is today. They had wooden creaky floorboards and cooked fish and chips in the restaurant at the back of the store, so some things had the aroma of food after you got them home. Next to BHS was Johnson Bros which was a lovely store until it burnt down, not sure of the date that that happened. I also remember Bewleys, the tobacconists at the bottom of Dean Street on the opposite corner to Boots the chemist. Just up Dean Street on the right was the Kangaroo Club, but after that closed down in the late 60s it became a ‘white elephant’ and nothing lasted. Further along Western Road before Debenhams there was the Scandanavian Coffee Bar, with mods and beatniks, as my husband seems to think they were called. Opposite that was a Wimpy Bar and a fabulous coffee shop where I can still smell the aroma of freshly roasted coffee. Close by that, above one of the shops there was a nightclub but I can’t remember what that was called. I know they used to play Procol Harem, Whiter Shade of Pale a lot when I went in there probably under age but thought I was very grown up as it was quite sophisticated. With reference to my previous comments, I have found out that Johnson Bros in Western Road burned down on 5th November 1970. How well I remember Western Road. My first job was in Richard Shops in 1959 and I used to buy my underwear in a lovely little shop called Dorothy Perkins. Are they still going? I have lived in Australia for more than 40 years now and I recently returned to Brighton and was very sad to see how Western Road had deteriorated into a jumble of shops mostly selling cheap rubbish. I remember the lights at Christmas and how freezing cold it was waiting for the bus home.